Alpacas are camelids, related to the camels of Africa and Asia, and also to their nearer cousin the South American llama, being themselves generally softer and smaller. There are two types: Huacaya and Suri. 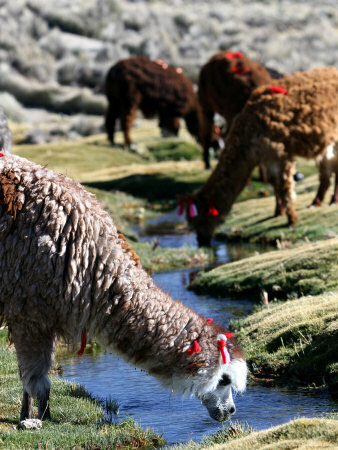 Huacaya alpacas have a sheep-like fleece, whereas suri alpacas carry long silky hair. Ninety-five (95%) percent of alpacas are huacaya. Although centuries ago the Peruvians domesticated their llamas as beasts of burden they kept their alpacas for the soft fleece, and in ancient times this was reserved for royalty. After the Spanish invasion of South America the alpaca went into decline but its fleece became fashionable once more in the nineteenth century. This revival is largely to be credited to the English industrialist and social reformer Titus Salt who took a risk in buying a consignment of unwanted wool at the port of Liverpool, and experimented in his Bradford textile mills (Saltaire) until he found a way of weaving the fibre into a fabric which became recognised as the ultimate in luxurious softness. Alpacas are mostly pleasant-natured, and easy to train, which makes them good to have around. Alpacas are safe animals, making wonderful pets in addition to producing fine and valuable fleece. They sometimes get a reputation for spitting (and it is foul smelling) but although some will occasionally spit, and their personalities vary, spitting is mostly reserved for other alpacas, not for humans. Sometimes, though, a human gets in the line of fire and it’s not pleasant. Alpacas rarely spit at people unless frightened or abused, but will do so to make complaints against each other. Once they are socialized most alpacas will readily tolerate being stroked or petted. In their pasture areas alpacas cause very little disturbance to the earth as they have padded feet and eat mainly the tops off the grass. They adapt to widely varied habitats, not only in different areas of the world but also from sea level to from 15,000 feet. Depending on the quality of the land, alpacas can generally be kept at between 5 and 10 per acre. The more animals per acre the more hay is required to top up the grass provision. However, they don’t require highly specialised shelter or care, have a good life span of from 15 to 20 years, and are considered quite disease-resistant which helps to keep insurance and veterinary costs down. Alpacas are sheared once a year for their fleeces. They are beautiful animals, and come in a great variety of colours, 22 in all, ranging from blue-black through greys, browns and fawns to white. Many call them the world’s most promising livestock investment. They can provide a satisfying addition to an investment portfolio, and if you keep them yourself they also can contribute to a healthy lifestyle.